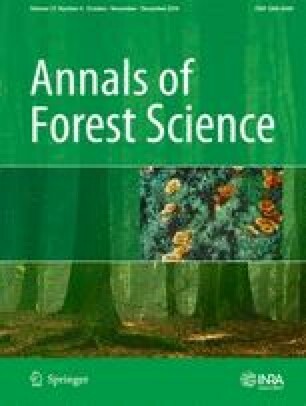 This analysis of the tools and methods currently in use for reporting woody biomass availability in 21 European countries has shown that most countries use, or are developing, National Forest Inventory-oriented models whereas the others use standwise forest inventory--oriented methods. Knowledge of realistic and sustainable wood availability in Europe is highly relevant to define climate change mitigation strategies at national and European level, to support the development of realistic targets for increased use of renewable energy sources and of industry wood. Future scenarios at European level highlight a deficit of domestic wood supply compared to wood consumption, and some European countries state they are harvesting above the increment. Several country-level studies on wood availability have been performed for international reporting. However, it remains essential to improve the knowledge on the projection methods used across Europe to better evaluate forecasts. Analysis was based on descriptions supplied by the national correspondentsinvolved in USEWOOD COST Action (FP1001), and further enriched with additionaldata from international reports that allowedcharacterisation of the forests in these countries for the same base year. Methods currently used for projecting wood availability were described for 21 European countries. Projection systems based on National Forest Inventory (NFI) data prevail over methods based on forest management plans. Only a few countries lack nationwide projection tools, still using tools developed for specific areas. A wide range of NFI-based systems for projecting wood availability exists, being under permanent improvement. The validation of projection forecasts and the inclusion of climate sensitive growth models into these tools are common aims for most countries. Cooperation among countries would result in higher efficiency when developing and improving projection tools and better comparability among them. Susana Barreiro and Mart-Jan Schelhaas designed and finalized the paper. Susana Barreiro, Mart-Jan Schelhaas, Gerald Kändler, Clara Antón-Fernández and Jean-Daniel Bontemps structured the paper. Susana Barreiro, Mart-Jan Schelhaas, Gerald Kändler, Clara Antón-Fernández and Antoine Colin analysed the country reports for the synthesis. Susana Barreiro, Mart-Jan Schelhaas, Clara Antón-Fernández, Gerald Kändler, Antoine Colin, Jean-Daniel Bontemps, Iciar Alberdi, Sonia Condés, Marius Dumitru, Angel Ferezliev, Christoph Fischer, Patrizia Gasparini, Thomas Gschwantner, Georg Kindermann, Bjarki Kjartansson, Pál Kovácsevics, Milos Kucera, Anders Lundstrom, Gheorghe Marin, Gintautas Mozgeris, Thomas Nord-Larsen, Tuula Packalen, John Redmond, Sandro Sacchelli, Allan Sims, Arnór Snorrrason, Nickola Stoyanov, Esther Thürig and Per-Erik Wikberg wrote the country reports and checked the synthesis. Forests provide multiple goods and services and play a major role in policy making and decision-making processes on cross-sectorial areas from forest industry to energy. The forest sector can significantly contribute to mitigating climate change by sequestering carbon in forests and in harvested wood products, as well as by using wood to replace materials and energy of non-renewable sources, or materials that require fossil energy for their elaboration. For the period 1990–2010, forest area has increased in Europe and wood harvesting has decreased. These factors, combined with other factors such as the occurrence of favourable growing conditions, improved management practices, local harvesting difficulties, and the increase of protected forest areas, can explain the increase in growing stock (Forest Europe, UNECE, FAO 2011, p 292). Parties to the Kyoto Protocol have committed to reduce greenhouse gas (GHG) emissions by at least 18 % below 1990 levels for the period 2013–2020, and increase the use of wood products as a post-Kyoto decision. By 2020, it is also expected that 20 % of the energy produced in the EU will come from renewable energy sources, although national targets vary considerably. Also by 2020, and in line with the new EU Forest Strategy (COM 2013), harvest rates are expected to increase 30 % compared to 2010 estimates. Moreover, the ambitious targets for wood and renewable energy foresee an upcoming competition between the demands for wood and biomass for energy (UNECE 2011). Therefore, the question of how much woody biomass is available from European forests on a sustainable basis has received substantially increased attention over the last two decades. Several European projects and Cost Actions have aimed at improving knowledge on the current woody biomass demand and supply situation, and have attempted to project its future development as a consequence of ongoing policy processes. The European Forest Sector Outlook Study II (EFSOS II) points to a constant growth of wood energy and to an expansion in wood supply (especially from forest residues) if no major changes occur in terms of policies. In the meantime, under the scope of the EUWood project (Mantau et al. 2010), a tool was developed to compare woody biomass supply and consumption, taking into account all primary and secondary sources. Volumes of wood used by the forest-based industries proved to be greater than those published in national/international felling (or forest) statistics for more than half of the countries under analysis, revealing a total difference of 47 million m3. This tool has been further developed under the scope of USEWOOD and its current version is described in Mantau et al. (2016) (this issue). With woody biomass demand increasing, and reported inconsistencies between reported supply and industrial consumption, it is essential that traditional forest-based industries, the bioenergy sector, and policy makers have access to accurate and harmonized information on future usable woody biomass at a European level. A European project, DIABOLO, is now in progress with the aim of strengthening the methodological framework towards more accurate, harmonised and timely forest information (on growing stock and stock changes, biomass, carbon and non-wood forest products). USEWOOD Cost Action (FP1001) proposed to describe the national methods used for assessing the potential sustainable wood supply, as a baseline to identify common pathways for progress as well as more understanding about underlying differences and upcoming harmonisation challenges. The first efforts to collect forest information at a national level were initiated already in the nineteenth century (Tomppo et al. 2010; Winter et al. 2011), but the development of modern National Forest Inventories (NFI) based on statistical sampling dates back to the early years of the twentieth century. NFIs have been reshaped over the years to cover aspects such as biodiversity and forest sustainability criteria and indicators, as a consequence of increased demand for forest data and reporting requirements at national and international levels. Although there are still many harmonisation challenges (Tomppo et al. 2010), the basic set up of the NFI systems is nowadays similar, as a consequence of convergence and optimisation of the underlying methods. Traditionally, Eastern European countries collected nationwide forest information through Standwise Forest Inventories (SFI), as part of a 10-year cycle of updating their Forest Management Planning (FMP). Forest management plans prescribe the silvicultural treatments to be carried out for the duration of the management plan. The survey methods used for SFI vary among countries, and may range from simple visual assessment, partly supported by yield tables (YT), to varying sampling schemes. This methodological diversity (partly without assessment of uncertainty) hampers comparability of the results. Most of these countries (e.g. the Czech Republic, Estonia, Hungary, Lithuania, Romania, Slovakia) are now carrying out NFIs simultaneously with traditional SFIs. In the early 1850s, yield tables were used to estimate future forest growth and production, essentially at a local operational scale (Peng 2000). Over the past century, empirical growth models and yield tables have become widely used by forest managers to evaluate silvicultural options, and to estimate the present and future volume of timber of their forests. Currently, existing projection systems comprise a variety of methods that range from the original yield tables to more evolved models including stand-level models, distribution-based models, individual-tree models, and more exploratory process-based eco-physiological models (Rennolls et al. 2007). More recently, the respective merits of empirical models and process-based models have been discussed from the perspective of environmental changes (Fontes et al. 2010; Landsberg 2003) and new silvicultural management treatments (Amaro and Tomé 1999; Amaro et al. 2003). Due to input requirements and greater complexity, and also to the primary focus at lower organisational levels in forest ecosystems, process-based models are currently of limited use for projections of national wood availability. However, the dynamics of forest resources and the context of rapid climate changes will impose restrictions on the applicability of empirical-based tools over the longer-term and will require further research. A recent example of integrating process-based model results into an empirical-based tool is given by Schelhaas et al. (2015) where 4C forest model (Reyer et al. 2014) results for many individual plot locations were transformed into species- and region-specific factors to change future increment rate in EFISCEN. Most countries that have adopted empirical growth models base their simulations on individual-tree models that are suited for simulating complex systems like mixed and uneven-aged forests and/or individual-tree based management strategies. Such models are generally found in Northern and Central Europe. However, calibration of this type of models often requires comprehensive spatio-temporal data on re-measured tree populations, which are expensive and usually not available (Rennolls et al. 2007). Large-scale matrix models based on transition probability matrices are also being used to predict future forest state, for example in the Netherlands, Denmark, Bulgaria, France and Italy. Projections tools are developed primarily to assist policy makers in the elaboration and evaluation of forest policies. This is often implemented as a scenario analysis, showing the consequences if different policy options were implemented (UNECE 2011). Early policy questions focussed on concerns of overharvesting, while the balance between timber production, biodiversity conservation, recreation and other forest functions gained importance in the last decades of the twentieth century (Nabuurs et al. 2014). The first projection tools were originally designed to answer questions regarding wood availability. However, more recently, the carbon sequestration function of the forest in relation to management and harvest became important (Pilli et al. 2013), as well as expected effects of climate change on growth and vitality (Schelhaas et al. 2015), and wood availability for the bio-economy as a whole (Verkerk et al. 2011; Mubareka et al. 2014). Most projection tools often encapsulate modules responsible for simulating specific events, and processes such as thinning, harvest, growth and mortality. Sometimes, stand regeneration modules are also included, as well as modules to account for disturbance events with socio-economic impact (e.g. forest fires). To cope with emerging needs from policy makers, projection tools are under constant improvement being extended according to necessity. These tools should be capable of answering the questions at hand, being oriented towards crucial areas (e.g., market demand, management, hazards, climate), and thus include modules covering the most important processes. Simulators should also produce relevant outputs covering both wood and non-wood forest products. Generally, these tools can be applicable at a regional/national scale for shorter or longer planning horizons. This review describes the status and trends of European countries’ projection systems in a structured way. This analysis is based on descriptions supplied by the national correspondents involved in USEWOOD COST Action (FP1001), and is further enriched with additional data from international reports (Forest Europe and FAO 2011) that allowed characterisation of the forests in these countries for the same base year. The descriptions vary significantly, depending on the data collection and reporting methodologies. Nevertheless the national descriptions focus on the methods currently used to project forest growth and future wood availability. Aspects related to temporal resolution, planning horizon, required input information, type of growth models and outputs are also covered in these descriptions. A particular emphasis has been placed on model components dedicated to forest management (thinning, harvesting, regeneration, etc. ), land-use changes and climate change. The scope of this review comprises 21 European countries. They were grouped into five regions (Fig. 1) according to their differences and similarities: Northern-Europe (NE), North-western Europe (NWE), Central Europe (CE), Southern Europe (SE) and Eastern Europe (EE). The criteria used for grouping the countries were forest area, forest types, forest sector contribution to gross value added (GVA), type of data inputs and type of simulation tool (Tables 1, 2, 3). Even-aged stands of Picea abies, Pinus sylvestris, and Betula Spp. Even-aged stands of Picea sitchensis, Picea abies and Pinus contorta. Mixed stands’ area simulated as pure using canopy percentage. Empirical, single tree plot based simulator. Regional to national aggregation of plot data. Stand-based simulator, to be used at a forest estate/regional levels. Country-wide simulations are the sum of regional simulations. The subsequent sections briefly summarize the characteristics of the projection systems in each region supported by Table 2. Projection systems are further compared in the discussion section (Table 3). Northern Europe is characterised by countries that have a high forest cover, large areas of forest, a relatively large contribution to GVA and a small number of tree species. The region has a long history in developing NFIs and projections. Finland and Sweden use stand-level simulation tools using individual tree-level models while Norway uses a stand-level decision support system based on the average tree per stand. Central European countries have a long forestry tradition. Their forest cover is in the range of 30–45 %, but with an important national forest sector. Norway spruce is an important commercial tree species, along with Scots pine, oak and beech. Their NFIs have been running already for several decades, and projection systems are closely tied to NFI data. Except for France, projection systems used in this region are single-tree distance-independent growth simulators using NFI sample plot and tree data as input, and integrate assortments/drain modules responsible for thinning, and final felling where thinning regimes, target diameters and rotation lengths can be controlled. In France, large-scale age-class and diameter-class (pure even-aged and other situations, respectively) models are used depending on the type of forests to be simulated. Countries in north-western Europe share a history of severe deforestation in the distant past and afforestation activities over the last century, leading to forest cover of less than 15 %. Development of NFIs and projection systems are more irregular, depending on fluctuating policy interests such as carbon sequestration (Iceland, the Netherlands) and increased attention to the development of forest industries and availability of biomass for bioenergy (Ireland, Denmark). A range of different projection tools is being used, such as matrix-models based on aggregated NFI data (e.g. Denmark, the Netherlands, France), a process-based model (the Netherlands), and simple stand-level empirical models for the main tree species (Iceland). Irish projections rely on stand-level inventory data (SFI), with different projection methods for private and public forests due to differences in information availability. Southern Europe is characterised by highly diverse forests, in terms of geomorphological features, climatic conditions, tree species and mixed and/or uneven-aged forest structures. These features have contributed to difficulties in the development of nationwide tools capable of projecting woody biomass availability, although NFIs are carried out in the region. Available forest growth models and simulators are only applicable to intensive even-aged forestry, and for specific regions. Uneven-aged forests, mixed forests or non-productive species still lack projection tools. In Italy, an application of the Canadian Carbon Budget Model, (CBM-CFS3, Kurz et al. 2009) was proposed by Pilli et al. (2013) using aggregated NFI data. In contrast to Spain and Italy, Portugal has strongly favoured plantation forestry, with 72 % of its forested area represented by only three species. A demand-driven regional forest simulator is available, using NFI plot data as input. In most Eastern European countries, forest is important in terms of area and their contribution to the economy. They have a long tradition in SFI as a basis for the preparation of FMP. Except Bulgaria, all these countries have implemented a sample-based forest inventory system in the last two decades. However, official projections of wood availability are still obtained by combining SFI/FMP data and yield tables (YT). All countries are in the process of developing or adapting their projection systems so that they will be based on NFI data. The problem of wood availability and over-exploitation of resources is a common theme in the history of all European countries. However, industrialisation and the mechanisation of agriculture encouraged farmers to abandon agricultural land in marginal areas allowing these areas to return to forest. With the technical changes in silviculture and the present afforestation policies, the transition of abandoned agricultural areas to forest is expected to be faster than in the past (Mather and Needle 2000). Over time, countries initiated sample-based national inventories to characterize and better monitor the state of their forests (Tomppo et al. 2010). In the Nordic countries, NFIs were launched primarily to assist forest management and industry investment planning, whereas in Central European Countries NFIs have aimed at monitoring forest sustainability (Tomppo et al. 2010). A next logical step was the development of forest resource projection methods, as support for forest policies. As with most NFI programs, national projection programs were also started in the second half of the twentieth century. Over the past century, increasing afforestation efforts have been implemented in many European countries, partly to compensate for the over-utilization of forest resources required to meet the demand of the wood industries and/or to improve the economic value of unproductive areas, following agricultural land abandonment (McGrath et al. 2015). North-western European countries have increased their forest cover from nearly no forest to about 10 % forest cover during the last century (Fuchs et al. 2015). Also other countries, like Switzerland, have seen their forest area expand due to active afforestation efforts, but also due to the abandonment of agricultural land and changes in the timber line at high altitudes and latitudes (Gehrig-Fasel et al. 2007). Currently, the percent cover of forests ranges from 1 % of the land area in Iceland, to more than 76 % for Finland (Table 1). Countries from the Northern Europe region have the greatest forest cover as well as the greatest contributions to the GVA, whereas those from the North-western region not only have the smallest forest areas, but also the smallest contributions to GVA (Table 1). Countries from the remaining regions have average forest cover of approximately 34 % of the land area, and varying contributions to GVA, with the most significant contributions in Estonia, the Czech Republic, Lithuania, Portugal, and Austria. After long periods of degradation and over-utilisation, all European countries report an increase in growing stock volume in the second half of the twentieth century (Forest Europe and FAO 2011, p 292). The harvest levels are relatively stable (e.g. Norway and the Netherlands) or have increased only gradually over time (e.g. France and Switzerland), but the increment in growing stock volume has increased dramatically (Bontemps et al. 2010; Charru et al. 2010; Nellemann and Thomsen. 2001; Pretzsch et al. 2014). Reasons for this increase are improved silviculture (e.g. Sweden and Norway) and afforestation, but the increment is most likely also influenced by nitrogen deposition (Nellemann and Thomsen 2001; de Vries et al. 2009; Bontemps et al. 2011) and climate change (Charru et al. 2010; Pretzsch et al. 2014), changes in the stand age structure (Vilén et al. 2012), and changes in tree species composition (Pretzsch and Schütze 2009). According to some authors, the increase in total increment in Europe seems to have ended (Kohnle et al. 2014; Nabuurs et al. 2013), although countries still report ongoing increases in growing stock, despite several serious storm events (e.g. France, Switzerland, Sweden) as stated in the State of European Forests report (Forest Europe and FAO 2011, p.292). The large gap between harvest and increment and the large standing stocks are often seen as a potential for increased use of forest biomass (UNECE 2011), which is needed to satisfy the high bioenergy targets set by the European Union (EU). However, not all forests are available for wood supply. France hence reports that one-third of the area available for wood supply is difficult to access, which decreases the profitability of harvest operations (Inventaire Forestier National IFN 2010). In Switzerland, harvesting amounts already outbalance net growth in easily accessible forests in the Plateau. Large harvesting potentials are located in the Alps and Southern Alps in poorly accessible regions, and are therefore difficult to harvest (Brändli 2010). Other assessments conducted in France also show a significant gap between the potential wood availability and the actual fellings, due to physical, socio-economic, and environmental constraints (Colin and Thivolle-Cazat 2016). Moreover the large fragmentation in private ownership and lack of interest of the private owners is a serious mobilisation challenge (Verkerk et al. 2011), and has already been addressed in the first European Timber Trend Study in 1953 (UNECE/FAO 1953). Over time, the aim of the forest resource projections has shifted. The early projections were aimed at supporting policy measures to prevent over-utilization, while at the same time guaranteeing a steady supply of raw material to the industry (e.g. Sweden). As the resource progressively recovered, balancing wood production with other forest functions such as nature conservation, protection and recreation became more important (e.g. Denmark, Finland). More recently, the ratification of the Kyoto Protocol has influenced the decision to continue (the Netherlands) or expand (Iceland and Italy) efforts in forest monitoring and resource projections. Also concerns regarding climate change impacts (e.g. Austria, the Netherlands) and bioenergy targets (Finland) are addressed in the latest projection studies. To facilitate the discussion of the state of the art of projection systems in Europe, the tools available are discussed by sections: growth module, forest management implementation, inputs, outputs, links to outside tools and uncertainties. Table 3 summarises the main characteristics of these tools. Projections in countries with an SFI system are often an aggregation of all FMPs and usually span only 10–30 years (e.g. Bulgaria, Hungary, Slovakia, the Czech Republic). Whereas the development of NFI systems shows a convergence over time, the resource projection systems show a great variability of methods. One reason lies in their recent development; a second reason lies in the strong disparities in the nature of forests across Europe. The most detailed simulators have individual tree growth modules with either diameter (Finland, Sweden, Germany) or basal area (Austria, Switzerland) as the target variable, some combined with tree height growth models. In some cases, the individual tree models are constrained by plot-level models (Sweden and Portugal). These simulators are applied to individual NFI plots, as are also the simulators based on the development of the ‘average tree’, which represents each NFI plot by an ‘average tree’ and the number of trees per area (e.g. Norway). Other countries use an aggregation of NFI data in large-scale matrix models simulating the dynamics of diameter-based, stem number distributions (e.g. France) or age-based area distributions (e.g. France and Denmark). Matrix models are commonly used at the European level (Nabuurs et al. 2007; Packalen et al. 2014; Verkerk et al. 2011; UNECE 2011). In the Dutch case, NFI data are grouped into forest types, for which an average growth curve over time is developed. With one exception, all simulators are empirical models. Only in the Netherlands was a process-based model applied, but in combination with an age/volume matrix model. Ireland also applies two different methods, because available input data are not the same for privately and state-owned forests. France has separate tools for even-aged and uneven-aged forests, while Spain and Italy have no national projection tools, but have the methodology only for certain species and/or regions. Independent variables for the growth modules usually include tree level variables (age, diameter, tree species), stand variables (total basal area) and site variables (soil, altitude, slope and aspect). Only a few also include climate variables such as precipitation and temperature as state variables (e.g. Austria, Portugal). The Finnish simulator can account for climate change effects, but this feature is not used in standard calculations. Climate effects can also be taken into account in the Swedish simulators by increasing growth through changing site factors using runs of BIOMASS process based model run under different climate scenarios as a benchmark. The more simple simulators rely on yield tables for growth projections (e.g. private forests in Ireland, Denmark, the Netherlands, the Czech Republic, Slovakia). The simulators work with time-steps of 1 year, 5 years or 10 years, except for the process-based simulator in the Netherlands, which operates on a monthly time-step. The time-spans of the published projections generally range from 20 years to 100 years. Most of these tools have regeneration sub-modules responsible for initializing stands after harvest either by artificial regeneration (e.g. Finland, Sweden, Portugal, Lithuania, Germany) and/or natural regeneration (e.g. Austria, Finland). In the Swedish simulator, for instance, following harvest, new stands are established by imputing a tree population from a young forest database. Similarly, the Swiss simulator randomly selects an NFI plot with similar site conditions and assigns its stand variables to the harvested area. In the age-class models, the harvested area is usually replanted with the same species and enters the smallest age-class with some delay. Several simulators allow the ingrowth of new trees within an existing stand (e.g. Sweden, Austria, Portugal, Lithuania). The process-based model in the Netherlands is the only one that explicitly models seed dispersal and germination. All projection systems include thinning and final felling routines. They generally depend on the level of detail of the simulator and how elaborated the management routines are. The individual tree simulators allow the application of different thinning criteria, periodicity and intensity, depending on tree species and stand structure. In the Finnish MELA simulator for example, criteria are based on a combination of dominant height and stand basal area. In the Austrian simulator CALDIS, thinnings are defined based on stand density, tree size or in a way to mimic the harvest patterns observed in the NFI. Thinning can be targeting a certain basal area (e.g. Germany, Lithuania), a percentage of the basal area increment (Switzerland) or a certain stem density depending on age or dominant height (e.g. Lithuania, and Portugal). A more simple approach applies a fixed thinning regime, depending on the species (e.g. Iceland). Age-class models work with an age range where thinnings can be applied and remove a certain percentage of the growing stock (e.g. France, the Czech Republic). The final harvest criteria in the simulation tools are also variable: depending either on age or diameter (e.g. Germany and Finland) or on age (e.g. Portugal, France age-class model). The age-class model in Denmark derives the final felling probabilities from consecutive surveys. The Lithuanian simulator includes an optimisation algorithm to smooth the age-class structure and maintain the balance between harvesting and increment. In the Finish simulator MELA, the assortments module allows for the removal of industrial roundwood, energy wood and/or waste wood and stumps as specified by the user. Some simulators include additional management actions, such as site preparation for planting, tending of young stands, ditching, pruning of pine (e.g. Finland, Portugal), fertilisation (e.g. Finland, Sweden, Portugal), species conversion after harvest (e.g. Austria, France, Finland, the Netherlands, Denmark), and options for afforestation and deforestation (e.g. France, the Netherlands, Denmark, Portugal). Some of the projection systems take hazards into account. The Portuguese simulator allows projecting burnt area (based on the fire scenario provided as input), whereas the Austrian, Danish, Swedish, Swiss simulators take windthrow events into account. The Austrian simulator considers also snow break events. The Bulgarian model calculates harvest levels as a percentage of the available standing stock at a given age and a forest appraisal index, reduced by the value of the current density (Kostov 1993). In Hungary, a reduction factor responsible for discounting the volume of thinnings and of dead trees is used. The information collected in the NFI and SFI systems is the most important basis for the simulators. Depending on the design, simulators need additional information such as yield tables (e.g. private forests in Ireland, Denmark, the Netherlands, the Czech Republic, Slovakia, Hungary), information for the initialisation of young stands (e.g. Sweden), climate data (e.g. Austria, the Netherlands, Portugal), costs and revenues (e.g. Italy, Lithuania, Portugal) and criteria to define assortments (e.g. Finland, Italy, Portugal). Additionally, GIS layers can be used for a range of purposes, such as stratification according to environmental zones or accessibility classes (e.g. Finland, France). The simulators can produce a large number of outputs, at different aggregation levels. Commonly produced outputs are the development of growing stock, thinning and felling amounts, increment, biomass and carbon stocks, tree species distribution, age-class distribution and/or diameter-class distribution. Outputs can be single tree lists (e.g. Austria and Germany) that can be post-processed, or a range of ready-made tables. All simulators produce volume outputs (growing stock, volume from thinnings and final fellings), based either on volume models for conversion from individual tree data, or directly in the case of age-class models. A few tools also integrate species-specific individual tree taper models for calculating volume by assortments (e.g. Finland, Sweden, Norway, Germany, Denmark, and Portugal). Most simulators also produce biomass estimates for various tree compartments (foliage, branches, root, stem), using biomass expansion factors that are based on volume or individual tree variables or biomass models. This allows the projection of the future amount of harvest residues available for bioenergy generation. Some simulators include output on economic variables such as costs and revenues. The Finnish simulator can be coupled to MELAOPT (Redsven et al. 2013) for forest area-level optimization. Furthermore, it can be linked to a Decision Support System (DSS), like the Portuguese simulator. The Austrian, Finnish, Norwegian and Swiss simulators can be coupled to YASSO (Liski et al. 2005) to include the soil carbon pools in the projections. The same soil model is included in the matrix model that is used in the Netherlands. Additionally, the Swiss simulator can be linked to a model that estimates the potential availability of wood and biomass given various types of ecological and socioeconomic constraints. The Lithuanian and Finnish simulators produce output that can be further explored using GIS systems. Scenario projections are always subject to uncertainties related to data and sub-models, the compilation of models into the simulator and the scenario assumptions made. All methods are based on observational data, and are subject to the usual uncertainties related to the data collection processes such as sampling errors and measurement errors. However, many NFIs provide sampling error estimates. The differences underlying different forest inventories methods are clear when estimates obtained using NFI and SFI are compared. This is illustrated by the Czech Republic, which reports a large difference between the total volumes reported by the FMP/SFI (650 million m3) and by the NFI method (900 million m3). The FMP/SFI method often relies on simplified assessments with insufficient measurements often using auxiliary information like yield tables linked with visual appraisal of stand conditions, a procedure that is generally prone to underestimation. Besides FMPs cover a somewhat smaller area because they do not include uneven-aged forests and not all owners report the required information. The simplified representation of reality in models leads to additional uncertainties. For example, because diameter-class models use aggregated data by forest strata, they lose variability regarding the interactions between trees in a stand (e.g. Norway, France), both in terms of dimensions and species. Furthermore, mixed-species stands are sometimes assumed to grow as if in pure stands (e.g. Norway, Portugal). Also mixed uneven-aged stands and/or multi-layered canopies are not uncommon in Norwegian forests, and are not correctly represented by the “average tree”. Many growth models do not include climatic variables (e.g. Switzerland), and the validity of especially long-term projections can be questioned. Also countries that do include climatic effects consider the effects of climate change to be one of the major sources of uncertainty. Another area where the models are considered uncertain is the development of old-growth forests (e.g. Sweden, Norway), catastrophic events (e.g. Norway, Sweden), mortality, regeneration and owner behaviour. This is related mostly to the difficulty of modelling stochastic events. Simulation tools should be validated for the whole span of their projection and simulation outputs, and their outputs should be interpreted rather carefully instead of seen as a prognosis. Only a few countries have carried out sensitivity analyses for (part of) their models (Switzerland, Norway, France diameter-class model). The French diameter-class model was recalibrated using 2006–2008 NFI data and a sensitivity analysis was carried out by Wernsdörfer et al. (2012). However, the French age-class model has not been validated. In Finland and Sweden, the main focus has been the validation of sub-models (Hynynen et al. 2002; Matala et al. 2003) and the validation of the growth models as is presented in Fahlvik et al. (2014), respectively. In Norway, there has been some efforts to validate AVVIRK2000 (Eid 2004), but more testing is needed to further validate the simulator and provide uncertainty estimates, as further research is also needed to validate the Finnish MELA analysis and provide uncertainty estimates. General model verification and accounting for random errors of MASSIMO was done as described in (Kaufmann 2001b). The evaluation of the growth models of MASSIMO was undertaken with a partial sensitivity analysis (Thürig et al. 2005) that showed the simulator to be very sensitive to stand age, which can lead to large deviations in the predicted increment. In turn, evaluation of the first version of the Icelandic forest simulator has shown some deviations in forest area projections for which a conversion factor is currently used for compensation. In addition, divergence between reported and projected removals indicates that further work is required to improve the tool. Countries with large forest areas and/or a large proportion of forest activities in GVA generally have a longer history of producing resource projections and, consequently, have developed better tools. This is linked to more governmental and/or industrial interest, expressed among others by long-term programs of tool development and production of projections. Countries with well-developed projection systems often have rather homogeneous forests with only a few important species, allowing the development of models at the stand or tree level. Mediterranean countries (e.g. Italy, Spain) and France especially report difficulties in developing nationwide projection systems due to the large variability in growth conditions, structure and composition of forests. When species-specific models exist, they are often not applicable at the national scale (e.g. France and Spain), because they are usually developed for the highly productive regions only. In France this problem is accommodated by developing large-scale age- or diameter-distribution models parametrised for regional stratifications, but further development of these models is needed. In Italy, a regional species-specific parameterizations model has been developed, but cannot be scaled up to the country level due to the lack of a generally applicable growth model. Another problem in some countries is that the required data are not complete, or not consistent, for different forest categories. For example, FMP data for the Czech Republic covers only even-aged forests, and Ireland applies different projection methods for public and private forests due to a difference in detail of available information (Forest Service 2014). Not all countries are able to estimate increment directly from their NFI results and have to rely on growth and yield tables. Many countries report inconsistencies between fellings as assessed by their inventories, and harvest as reported by the statistical agencies. All countries were invited to report on developments that were foreseen for the near future, and improvements they would like to introduce. Many countries that have recently started regular NFIs expect to change their current systems to accept NFI data as input (e.g. Ireland, Lithuania), or expect to develop new methods based on NFI data (e.g. the Czech Republic, Romania, Hungary, Bulgaria, Lithuania). Because the current methodology is not applicable to all forest area in the Czech Republic, uncertainties on wood availability estimates are not quantifiable when based on FMP/SFI data. For this reason, when the second Czech NFI is completed in 2015, reliable data will be used for developing growth models and a new simulation tool. Correspondingly, Bulgaria has reported disadvantages in the use of FRAM (the Bulgarian Forest Resources Assessment Model), which has been complemented by the use of the EFISCEN model. However, given the urgent need for integrating functions other than timber production into forest management, and the increasing information needed for a range of international commitments, the program of the Executive Forest Agency of Bulgaria for 2012 strongly recommended the “Preparation and adoption of a program to begin the implementation of the National Forest Inventory”. Furthermore, Spain which has completed several NFI cycles intends to start constructing national growth models based on NFI data. Countries where repeated NFI measurements are becoming available are planning to review and update current growth models (e.g. the Netherlands) and/or use these data sets to validate existing models (e.g. Switzerland, Ireland, the Netherlands). In general, all countries wish to improve the current growth models and simulation tools, specifically to extend the number of species included (e.g. Ireland, Portugal), to improve ingrowth (e.g. Sweden), to better represent irregular or mixed forest structures (e.g. Norway, Portugal, Sweden, France), to better account for demographic processes (density-dependence of forest dynamics, France), and to include climate and climate change effects (e.g. Norway, Germany, Switzerland, France). In France, recent developments to improve simulation tools include the development of total aboveground volume models for the main tree species in France (Vallet et al. 2006; Loustau 2010) and a new generation of adaptive volume and biomass models (Dassot et al. 2012; Genet et al. 2011; Longuetaud et al. 2013). Newer research efforts are now in process to develop tools to represent demographic processes and the influence of the environment, including climate forcing. For the next forest country-wide impact analysis in Sweden, HUGIN will be replaced by RegWise, an improved version of HUGIN programmed in a more user-friendly way within the Heureka project (Wikström et al. 2011), by integrating improved versions of the growth, ingrowth and mortality models. Also models for estimating soil carbon and nitrogen, volume, dead wood biomass and carbon content (by decay classes), utilization of forest fuels (harvest residues) and its effect on carbon storage, income and growth, improved routines for continuous cover forestry, growth effects from retained trees and improved functions for ingrowth. Norway is also working on a new individual-tree framework for forest development scenarios that is expected to be ready in 2015, integrating an improved forest climate-sensitive growth module, a module for estimating vegetation and soil carbon, a module for life cycle analysis accounting, and a module for the estimation of uncertainty through Monte-Carlo simulations. Almost all projection models are empirically based, which limits their usability to observed conditions. In the context of global environmental change, the use of process-based models is therefore gaining relevance although there are a number of challenges to meet. Many of these process-based models have been developed and parameterized for specific tree species, smaller scales and local conditions. Application at large scales is hampered by the lack of harmonized datasets and also robust methods for parameterisation, evaluation and model comparison are difficult to obtain. Ways should be found to integrate the strengths of both approaches to improve credibility of projection results under a wide range of future conditions. On the input side, some countries mention the wish to better represent individual-owner behaviour (e.g. Germany, the Netherlands) and include more spatially explicit information by extracting site information such as distance to roads and soil characteristics from GIS maps (e.g. Germany, the Netherlands). Also mentioned is the wish to address the challenges related to the quantification of available roundwood for different uses by including secondary outputs, through the improvement of volume and biomass equations (e.g. France, Sweden), economic information (e.g. Germany, Sweden), soil carbon (e.g. Sweden, Norway), dead wood biomass, use of harvest residues (e.g. Sweden), non-wood forest resources, and forest environmental and recreational functions (e.g. Portugal, Lithuania). With the initiation of NFI programs in more and more countries, interest in producing projections based on these data is increasing. Many countries have started, or are starting, to develop their own projection systems. Strikingly, there is and has been very little exchange of simulators among the countries. Only the simpler simulators like the EFISCEN, G4M (Kindermann et al. 2013) and, more recently, the European Forest Dynamics Model (EFDM) (Packalen et al. 2014) have been applied to a range of countries. The more or less independent development has resulted in a wide array of modelling approaches, partly influenced by national differences in bio-climate, forest attributes and differences in NFI data, forest management practices and forest policy. From a research perspective this could be regarded as favourable, since independent development allows the comparison of modelling approaches and cross-validation of results. However, financially it is not very efficient to develop and maintain so many simulators. Although all countries probably wish to maintain sovereignty, more exchange of knowledge, data and even perhaps modules and simulators will increase both efficiency and comparability. In particular, countries developing their first projection tools could avoid problems that have already been solved in the other countries. Furthermore, the existing simulators also face challenges for the future, such as the incorporation of climate change, owner behaviour and extension towards simulating the full array of forest services. Most simulators currently take into account only the (potential) supply from the forest, while only very few include the demand side. Including demand also means consideration of imports and exports, and calls for the use of trade models and even more international cooperation in their development and application. Frameworks like those developed in EFSOS II and by the JRC (Mubareka et al. 2014) could play a role in that process. Forest policies have long-term consequences, and because forests are not a stationary resource, the development of robust projections systems capable of accurately simulating long-term dynamics of forests remains a challenge. The authors gratefully acknowledge all country report authors for their contribution in characterizing the tools and methods for woody biomass projection: Uli Riemer, Paolo Camin, Edgar Kaufmann, Thomas Ledermann, Kari Korhonen, Olli Salminen, Antoine Colin, Alain Thivolle-Cazat, Holger Wernsdörfer, Margarida Tomé, Stein Tomter, Sandra Clerkx, Alessandro Paletto, Fernando Garcia-Robredo, Roberto Vallejo, Andrius Kuliešis, Albertas Kasperavičius, Gintaras Kulbokas, Vilis Brukas, Edmundas Petrauskas, Henry Phillips, Mark Twomey, Maria Stoyanova, Radoslav Milchev, Klemens Schadauer, Martin Moravčík, Miroslav Kovalčík, Jaroslav Jankovič, and Tomáš Bucha. The authors also thank Geerten Hengeveld for his help in structuring the paper and to Ron E. McRoberts for revising the English. This review paper was accomplished under COST ACTION FP1001 “USEWOOD: Improving Data and Information on the potential supply of wood resources—A European Approach from Multisource National Forest Inventories” which funded the meetings of the group. Additional funding was provided by the SIMWOOD project (Grant Agreement No. 613762) of the EU H2020 Programme.